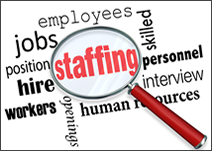 There are a lot of companies that look to temporary staffing firms for most of their hiring needs. They have established relationships with these firms and they trust their judgment on candidates. This is beneficial to job seekers because they can gain access to companies where it otherwise may have been difficult to get a foot in the door. Though most of the jobs start out temporary, many of them have the ability to turn into a full time career. When working with a staffing firm, they will usually assist in rebuilding your resume. They will help you identify your particular job skills, and you may find a skill you didn’t know you had. A better resume leads to better job opportunities. If you want help building a great resume, contact Symphony Placements today. You may be surprised to learn you can apply to jobs you didn’t think you could. Staffing firms also set you up with employment opportunities based on your skills and alignment between your personal values and the company’s message. It’s a good way to weed out companies you don’t want to work for without having to go through the trial and error yourself. Once you do get hired, you will have the benefit of a temporary position at first. We say “benefit” because although it seems like a temp job would be a ticking clock over your head at all times, it’s actually a great way to test the waters. You may realize during your temporary “trial run” that you don’t like the position or company – and that’s ok! When your time is up, you can have no qualms about leaving, or you may realize you love working there and you want to progress in your career. Many of the companies that work with staffing agencies are actually looking for permanent placement, but they’re using the temporary position to make sure the candidate is a good fit. If you’ve decided you want to stay with the company, express that to your recruiter and your manager at the company. Keep in contact with your recruiter often, and be sure to thank the manager for the opportunity. Contact Symphony Placements today to see your temp to perm potential!